The Nanny Joynt is thrilled to share an amazing position working with a wonderful family in Phoenix. This family has two sweet and inquisitive little girls. Their youngest daughter is 23 months old and is very active and affectionate. She is outgoing, funny and so sweet. Their oldest daughter is 3.5 years old and is a quirky, introverted and a very smart little girl. She enjoys playing with cars, trains and construction vehicles, although, she is a total girly girl. Both girls do have a nut allergy so their new nanny needs to be aware and on top of this at all times. This warm and loving family is looking for someone who will not only be able to take care of the children, but someone who takes pride in their domestic skills and is happy to help out where needed. A nanny who enjoys and is skilled with cooking would be a huge plus! This position is offering $20 – 28/hour at $50 – $60K a year! The schedule will be 40 hours a week with guaranteed hours, paid vacation, paid holidays and paid sick time. The schedule is currently listed below. Mom is a stay at home so some flexibility in the schedule may be needed. Their new nanny will need to be comfortable working alongside Mom as she is in and out of the house during they day. She is a stay at home and is involved with the girls and their schedules. She would like their nanny to be able to jump right in and help take care of things that need to be done. Making breakfast, lunch, household chores and preparing dinners. You should be happy playing with the girls or giving Mom a hand around the house. Someone who is structured, yet flexible is ideal for this family. You will need to be engaging, energetic and honest when working with this family. This family uses conscious discipline, redirection and breaks while focusing on the good behavior and not the bad. A typical day working with this family will include, but is not limited to: Making breakfast, playtime with the girls until lunch, making lunch and going on outings. Nap time while the nanny completes some household chores and possibly spending time with one child while Mom spends some one on one time with the other. Some days there will be activities to drive them too and in the evenings you will possibly help prepare a meal and then clean up while the family has dinner. This family does have one Golden Retriever who is an indoor dog. He will need to be walked, fed and given water daily so a nanny who loves dogs is needed. The family enjoys travel and will require their nanny to be open to traveling with them. They have a second home in Coronado, CA. They have spent the last few summers there and do go for short trips during the year. Nanny must be willing to spend Summers in CA. The home has a quaint casita for the nanny to have some private space while there. Please be ready for 3-5 months worth of traveling and adventuring with this family! They are seeking at least a one year commitment and hope to find a nanny who will be with them for years to come! This family is an honest, loving family who respects and supports the people around them. Honesty is very important to the family and they want their nanny to always be open, honest and trustworthy. Safety is a huge priority and they want their nanny to be present, engaged and responsible when caring for their wonderful little girls. This position requires that you not be on your phone or social media during working hours. They will truly appreciate a nanny that can help take on some of the heavy load that two toddlers can bring to a home. Dad works outside of the home and is currently working on building his business, he is a great communicator and enjoys being able to communicate with their nanny. Nannies, this is a great career nanny position for a someone who is dynamic, professional, caring and really looking for a career position with a wonderful family. This family sees the incredible value a nanny brings to their family and they are looking for an incredible person to join their team! 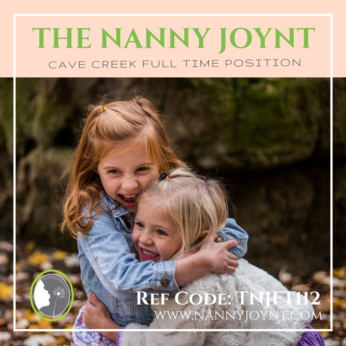 To be considered for this fantastic opportunity please email your resume to trisha@nannyjoynt.com please use Reference code – TNJFT112 in the subject line. Interviews will begin ASAP.